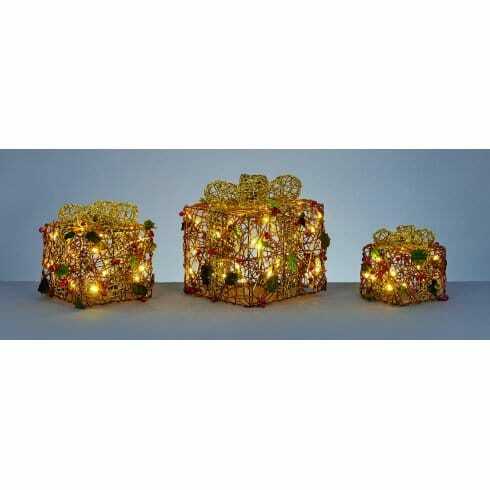 Premier Decorations Parcels features a charming set of 3 resin weave parcels with berries,gold bow detail and festive sparkling LED light. The product code for this Premier Decorations parcel sets is LV141618. The parcels are illuminated throughout with 40 warm white LED's which create a magical display of sparkling illumination making them an ideal addition to your Christmas decorations. Suitable for indoor or outdoor use and comes with transformer which must be plugged into an indoor socket. All 3 lights are wired together and operate from a single plug point. Also available in with gold bows or red bow's which can be ordered from our website.